Use in extreamly small parts up to tubes slightly less than 1/2 inch diameter. 0.7mm OD, 0.3 mm ID, 1m length, 0.4 grams. 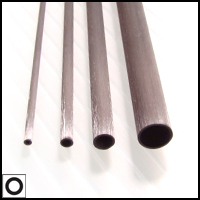 0.7mm OD, 0.3 mm ID, 2m length, 0.8 grams. 1.0 mm OD, 0.5 mm ID, 1m length, 0.8 grams. 1.0 mm OD, 0.5 mm ID, 2m length, 1.6 grams. 1.5 mm OD, 0.7 mm ID, 1m length, 2 grams. 1.5 mm OD, 0.7 mm ID, 2m length, 4 grams. 2.0 mm OD, 1.0 mm ID, 1m length, 3.5 grams. 2.0 mm OD, 1.0 mm ID, 2m length, 7 grams. 2.5 mm OD, 1.5 mm ID, 2m length, 9.2 grams. 3.0 mm OD, 2.0 mm ID, 5.6 grams. 3.0 mm OD, 2.0 mm ID, 2m length, 11.2 grams. 4.0 mm OD, 3.0 mm ID, 1m length, 7.7 grams. 4.0 mm OD, 3.0 mm ID, 2m length, 15.4 grams. 5.0 mm OD, 4.0 mm ID, 1m length, 11.1 grams. 6.0 mm OD, 4.0 mm ID, 1m length, 23.3 grams. 6.0 mm OD, 4.0 mm ID, 2m length, 46.6 grams. 6.0 mm OD, 5.0 mm ID, 1m length, 13.3 grams. 6.0 mm OD, 5.0 mm ID, 2m length, 26.6 grams. NOTE: Require oversize shipping charges. 8.0 mm OD, 7.0 mm ID, 1m length, 18.1 grams. 8.0 mm OD, 7.0 mm ID, 2m length, 36.2 grams.